Avid cyclists may never run out of water again, especially if Kristof Retezár is along for the ride! Mr. Retezár, an industrial design student at the University of Applied Arts in Vienna, is a finalist for the 2014 James Dyson Award. 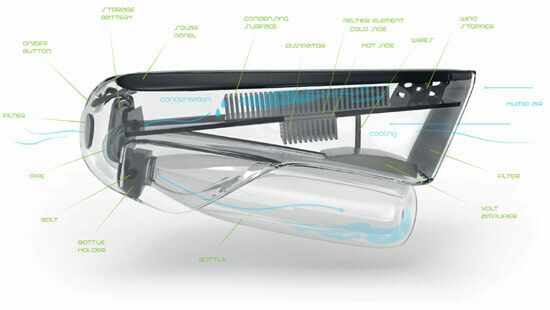 His award nominated design for the ‘Fontus’ is a self-filling bottle that literally makes water out of thin air. Appropriately named after the Roman god of wells and springs, the Fontus prototype collects and condenses moisture from the air while a bicycle is in motion. It then fills up a water bottle attached to the bike frame. According to a description on the James Dyson Award site, solar panels generate the electricity needed to cool the upper chamber of the device, while the bottom heats up. As the bike moves forward, air is pulled in, and then slowed and cooled as it moves through that upper chamber. 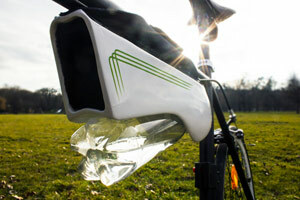 The moisture from the air then condenses into water and drips into a bottle. Using the principle of thermoelectric cooling, the prototype Fontus device can harvest 0.5L of water in an hour under the right climatic conditions. Optimal conditions are temperatures of around 20°C (68°F) and 50% humidity. Currently, the bottle does have a filter to keep dust out of the water, but it does not yet purify it. This may be important if the Fontus bottle is used in cities with low air quality. Harvesting water from the air is a method that has been practiced for more than 2000 years in certain cultures mostly in Asia and Central America. The Earth’s atmosphere contains around 13.000 km3 of mostly unexploited freshwater. This project is an attempt to discover these resources. The bottle may be able to help the two billion people in more than 40 countries who live in regions with water scarcity. It is predicted that 47% of the world’s population will be living in areas of high water stress in 2030. Mr Retezár has not ruled out raising money via crowdfunding and aside from consumer cycling applications, believes the product could be used to acquire fresh water in regions of the world where groundwater is scarce but air humidity is high. The prototype reportedly cost between $25 and $40 to make, but there are plans to refine the design before bringing it to market and setting a price for consumers.